There are no hard-and-fast rules in the admissions game. If your strategy is to play the same game as everyone else, the odds are against you. Once you stop trying to be the best at the things everyone else does, and concentrate your efforts on the things that only you do, you will be miles ahead of your competition. You start writing your applications years before you actually apply to college. The clubs you join, teams you play on, and classes you take, will play major roles on your college application. So picking these right classes, joining these best activities, and generally planning out your high school years needs to start early. 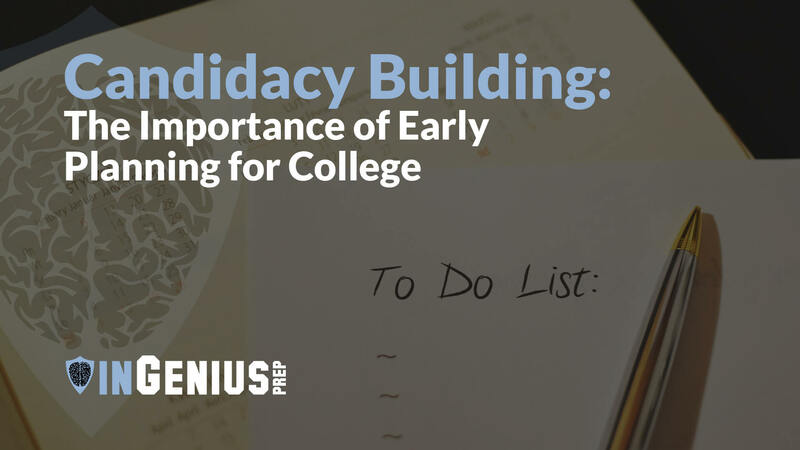 Candidacy Building™—preparing for college in high school—is the first and most crucial step towards applying to college. But by the time you actually apply, you can no longer change what these experiences are – you can only change how you frame them. So, if you’re asking questions like, “how to get into Stanford” in your senior year, you’ve started too late. This is why it is crucial to begin thinking strategically about applications years before you can even sign up for the Common App. Candidacy Building™ and preparing for college in high school involve strategic planning for every part of an application: choosing when to take the SAT or ACT, and how to study for them; the best class schedule that will capitalize on all of the resources your school has to offer; building strong relationships with teachers, mentors, or coaches who will write stellar letters of recommendation for college; finding and obtaining the best internships; focusing on interesting extracurricular activities; and the list goes on. By the time senior year rolls around, you should be able to demonstrate some, if not all of the following qualities: growth and potential, interests and activities, character and personality, and contribution to the community. Sounds great, but what does this actually look like in practice? Often, students and parents are confused by the myriad of options available to them. It is important to weigh the value of different activities. The goal with preparing for college in high school is to motivate yourself to take action and move forward, to plan ahead, and to prevent yourself from wasting time and energy on things that don’t contribute to your growth. The best way to stand out on an application is to codify your hobbies, interests, and passions. Join organizations, take on leadership roles, and grow within those organizations. Identify new and interesting ways of accomplishing the “necessaries” - don’t just join a community service organization, help start one, or lead an existing one in a new direction! Academic interests - If you are really passionate about an area of academic research (robotics, engineering, biology) you could apply for an internship working on a research project that might eventually result in publication. Community service - If you need to add some serious community service or volunteer work, try to combine your passion or skills (i.e., sports, theater, etc.) with your community service. You could start a sports league for underprivileged kids, or a theater group for children with emotional issues. There may also be organizations devoted to the particular area of passion which already do nonprofit work. Sign up for these sort of opportunities! They will stand out more than generic volunteer work that is unrelated to your interests. Start something - Nothing impresses an admissions officer more than a student with the leadership, charisma, and courage to strike out on your own and do something no one else has done. It could even just be a blog, as long as it is something which highlights your individual talents. Competitions - If you have a long-standing skill or talent such as drawing or painting, find a way to demonstrate just how talented you are. Competing in nationwide or international competitions, holding art exhibitions, or finding some means of displaying your work for an audience is a great way to show off your talent! The most important takeaway is that you should find ways to participate in activities that are important to you. Admissions officers will recognize your passion, it is up to you to show it through your experiences. Starting to identify these interests in Freshman year of high school is the first step of preparing for college in high school. Here is a list of what to consider as you move forward. Your Standardized Test(s) Schedule - When should you take the SAT or ACT and SAT Subject Tests? Which tests will you choose? How can you maximize this planning to get the highest test scores possible? Your Academic Schedule - When should you take certain AP classes? Do you want to plan your courses around SAT II test dates? Extra-Curricular Selection and Enhancement - Identify the extra-curricular opportunities both in and out of your high school, and identify ways that you can contribute more, or contribute smarter. Internships & Employment/Work Experiences - Research positions, community service work, and regular jobs always add to applications. Summer Planning and Scheduling - You want to make sure you have a plan (and a good one) for how you will spend time over summers. This is obviously also related to studying for standardized tests, internships, and employment. Recommendation Planning - As you identify possible recommenders (teachers, employers, etc. ), make sure that you are working towards building good relationships both in and outside of the classroom with them. Early School Selection/Planning - Once you’ve gotten a feel for your strengths and weaknesses, passions, interests, ambition, etc., you can start thinking about the best schools to fit your individual needs. The takeaway point is this: everyone has what it takes to become an excellent applicant if you begin preparing for college in high school early freshman year. Considering Candidacy Building™ – whether on your own, or with the help from our counselors through our Candidacy Building™ program – from the start can make the difference between a strong applicant and a “we-must-have-this-student” applicant. Especially with the increasing competitive nature at top schools, early planning is more important than ever! In the world of ultra-competitive admissions, realizing your educational dreams starts with figuring out why you are more deserving than the straight-A student next to you. Many times, the answer to this question will boil down to experiences, achievements, or qualifications beyond your GPA and test scores. The bottom line is simple: to succeed in admissions you must be great. In order to be great, you must put in the time.